what you can do with Kaisercraft Fozz felt! Well part of my job as the Product Development Manager at Kaisercraft involves playing with products to identify possible problems and uses for products. 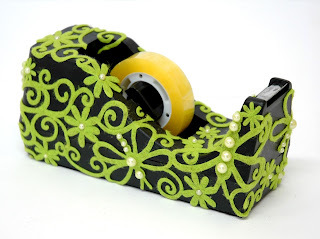 As part of this I was playing with some Fozz Felt yesterday, and when I was finished, I had a piece I needed to stick somewhere, and well I didn't have any paper, so it ended up on my Tape Dispenser! Well, me being me couldn't just stop at the piece I had placed on there and had to finish it off. I thought it looked cool, and it FEELS GREAT!! But still needed more, so I added some pearls. I just love how it came so I thought I would share it. 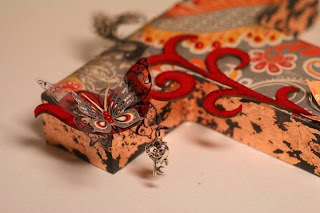 I think it is a good idea to take your scrapbooking products and see how you can apply them to everyday items, for a more creative look! Thanks Mikala for taking the photo for me!! Well, I finally got some more of my Design Team projects done for Tomorrow's Memories. 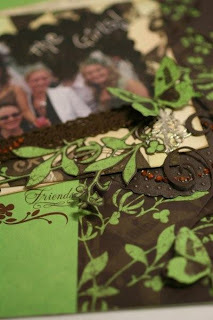 I am really enjoying getting back into my scrapbooking now that I am feeling a HEAP better. Morning sickness seems to have subsided which is GREAT. I can re-claim a little more of my life back as it is so hard to do things when you feel so crap! These pieces have been sent off to Tomorrow's Memories, so I will post the full pic's later in the week. If you would like to see them up close and personal..... pop into the store possibly next week when they would have definitely arrived! I am missing being able to pop into the shop (especially seeing I would most days when I was living in Perth) but the TM blog is a fantastic way to keep up with all the happenings..... that I am missing :( . If you have not yet checked it out click on the link under my links section and check it out. The girls have been great at keeping everyone up to date with all that is going on, and they have some awesome specials and giveaways going on at the moment.